This is not going to be a recipe post but a major food related nostalgia. I was in Banaras last month and I went to the few places we used to throng during our college days and later during research days too. 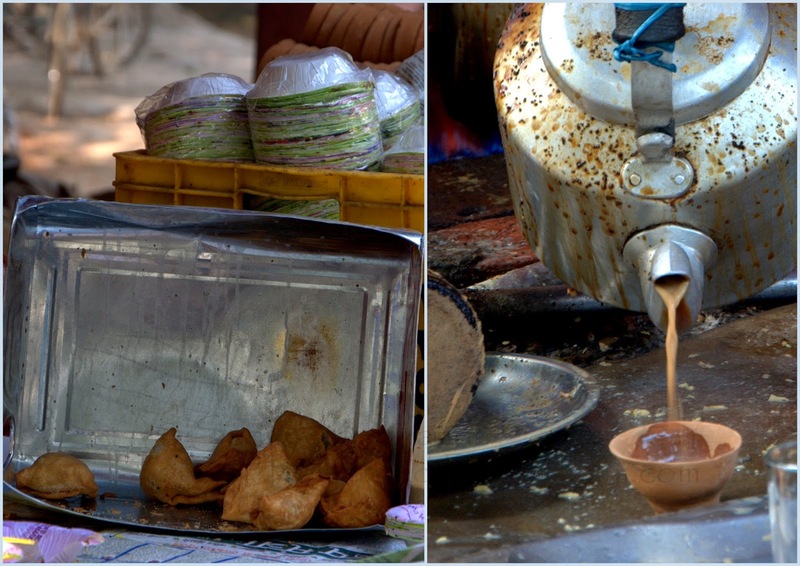 Bihari ki chai, samose and alu chop were universal gourmet food for us and we had the digestive fire to eat it all. Now after almost a quarter of a century gone by the chai and samosa is still the same, he has introduced a few more items to his menu and a few more hands on work. We saw alu stuffed kachoris and masala stuffed tomato fritters simply called 'tamatar' at his shop this time. It did not help that we were with some of our M.Sc. classmates. We had a reunion of class and enjoyed each oter's company, went to our department, met our teachers etc but Bihari ki dukan brought back the hidden child in all of us. All of us wanted to spend more time at Bihari's shop just watching at the things flying off the shelves, even though the shelves were just a makeshift tin to stock the fresh samosas for a few minutes. Till they landed in leaf donas and were lapped up hungrily by youngsters. 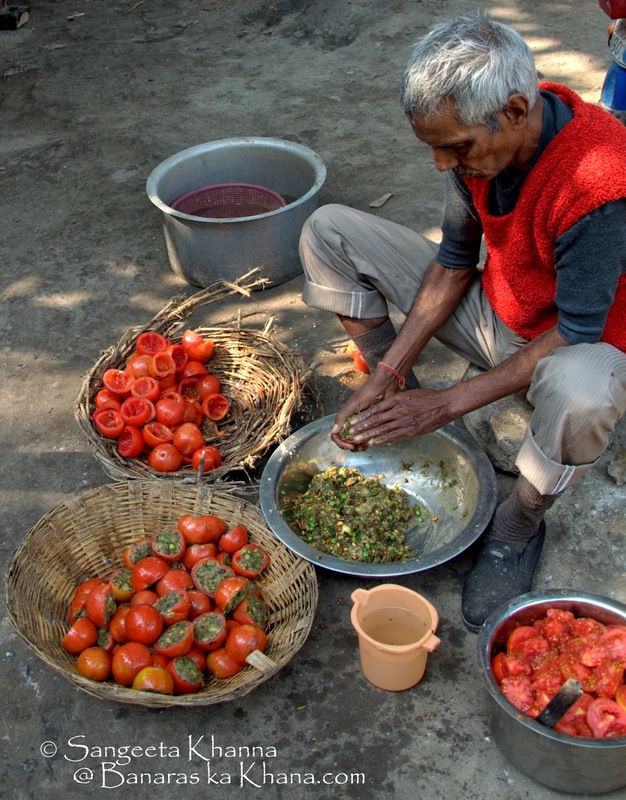 An old man was stuffing masala in emptied tomato halves. This tamatar bonda used to be such a favourite on rainy days I remember. See how spicy and yummy this filling looks. 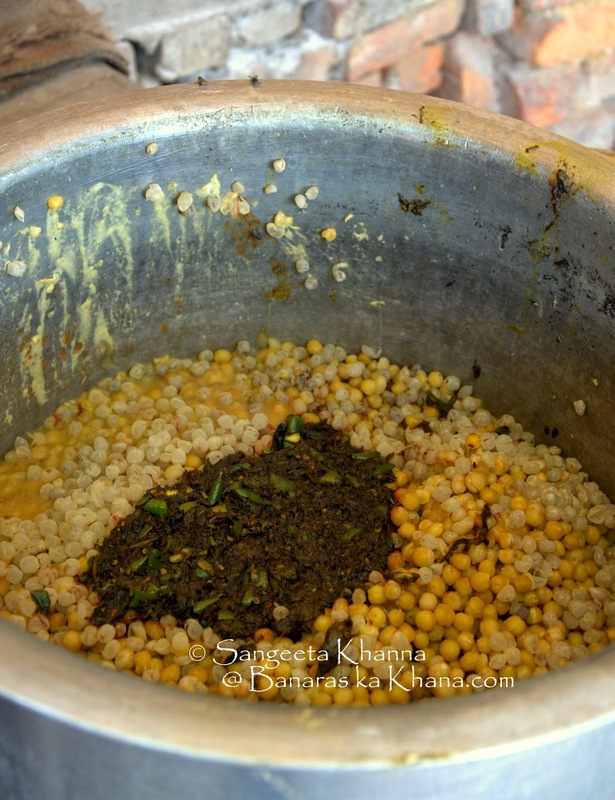 It has loads of green coriander, roasted peanuts and green peas along with potatoes and spices. This 'tamatar' is a limited edition snack as it is labour intensive and probably getting similar sized tomatoes would be additional effort too. They fry it in 2-3 batches around lunch time and it is available for just about an hour or so. We were lucky to see them being made and then returned at the right time to have a bite too. I find these kind of street foods healthier than any packaged foods and very satiating and filling too. And when these are deep fried at such high temperature there is no issue of hygiene as well. The frying oil can be a concern if you are eating them everyday and if the shop is frying the snacks in acrid burnt oil. I saw the oil looked transparent and fresh when I took pictures. A good thing to discover. 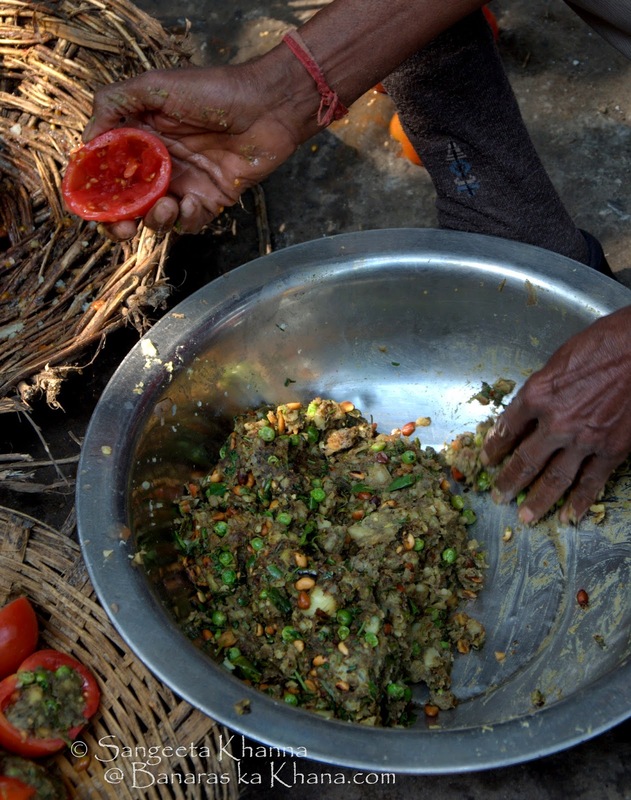 See this huge pot of 'matar chhole' being tempered with a spice mix. This is served with a round potato stuffed kachori they make. See the kachoris being shaped. How do they find such popular combinations and keep selling them for years, to generations and make such classics. Street food needs some more recognition I feel. It evolves along the changing palate of patrons but the core flavours remain the same. 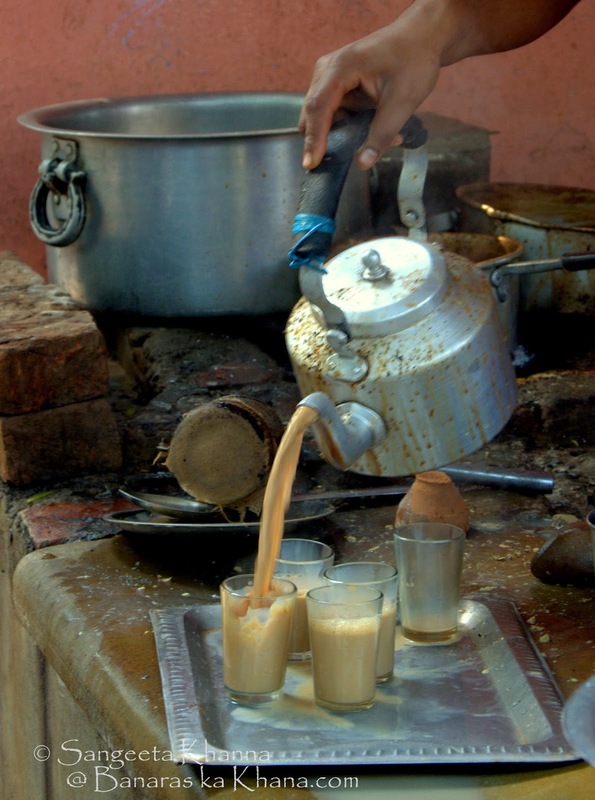 We did not taste any other snacks this time but had 2 rounds of the famous chai. Bihari ki chai as we used to call it. The chai has a smoky flavour to it, very milky and just rightly sweet for the temperament one gets when visiting such places. I missed not having those samose. But then we visited another classmate the next day who is a Professor in Agriculture department and he made us eat those samose :-) there are few things that make a way to reach you at the right time. Sangeeta, this is one of the most beautiful blog posts I have read, for its authenticity and simplicity. 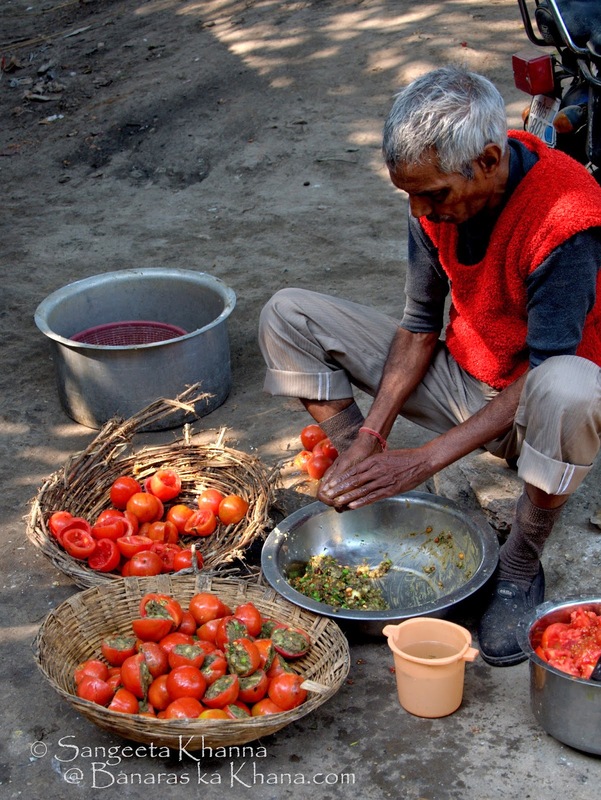 Although I have not tasted these tomato creations, your words and pictures wanted me to rush to Banaras. 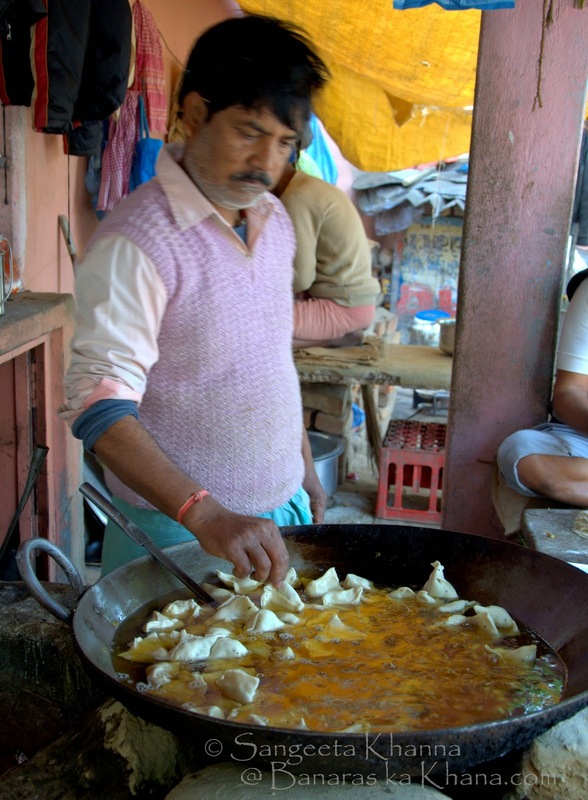 It also took me back to our days of 'bread pakora' and other street snacks, at University in Delhi. I look forward to every one of your posts, and to making that long overdue trip to Banaras to try out all these wonderful foods. Wonderful post..i will try those stuffed tomato bajjis. Street food needs some more recognition - very true. Yes street food is the taste of the masses as well as the classes I feel. Needs more recognition for sure. Awesome sangeeta!!! I feel sooo hungry looking at these snaps!! oh boy how i would love to have those stuffed tomatoes!! Lip-smackingly good!!! Beautiful clicks, i m able to feel the place thru the clicks!! Yes it is really good Priya. And doesn't become too oily when fried. 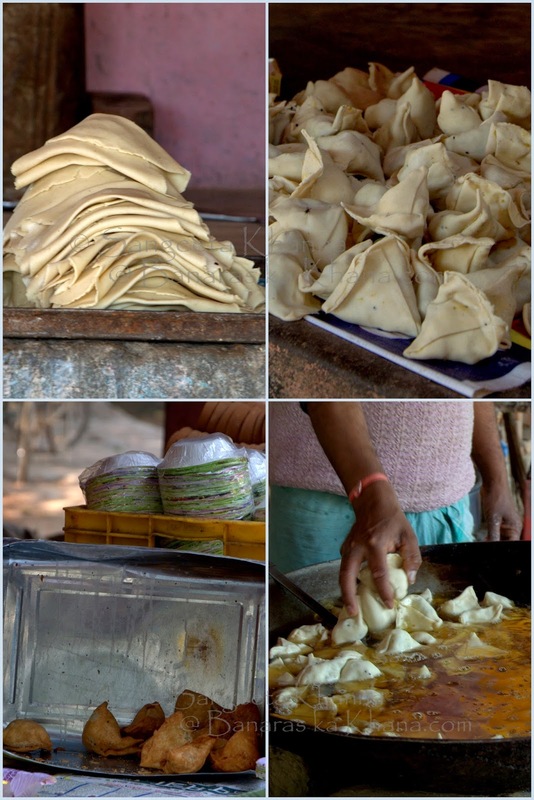 What I love about this blog is that some such wonderful story pops out along with the yummy description of food which only a gourmet cook like you can manage :) I had been to the city only once in my life in 2009 but hadn't known this blog or such wealth of information then. As for the hygiene value of these places, you are right. They are a darn sight more hygienic than some of the big hotels and the food is always fresh. The tomato fritter is genius! Yes it is :-) Thanks Gauri. Samosas with chai is always welcome. Can't resist it. 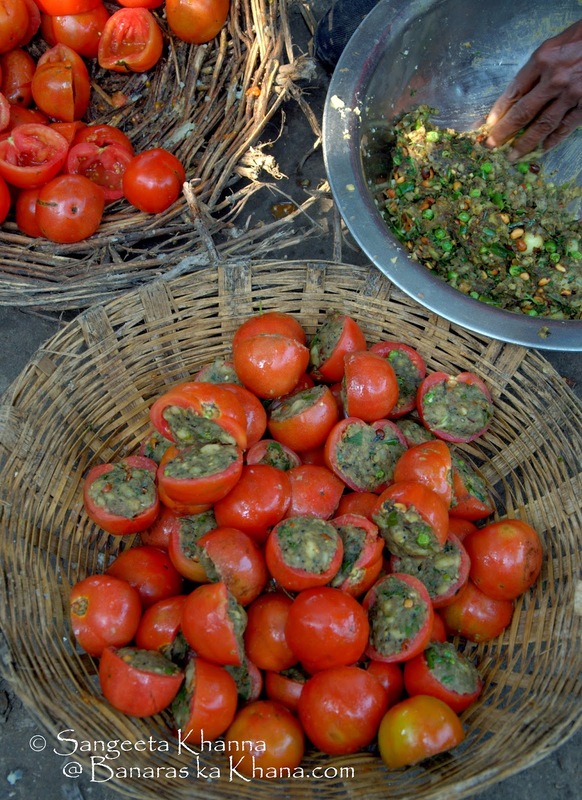 The bharva tamatar looks absolutely yummy! That's a new idea from Benaras. Have to give it a try sometime.